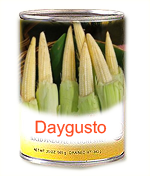 Canned Baby Corn in Brine 6/A10 300 Count Up 1,500 g. 2,950 g.
6/A10 250 Count Up 1,500 g. 2,950 g.
6/A10 200 Count Up 1,500 g. 2,950 g.
6/A10 150 Count Up 1,500 g. 2,950 g.
6/A10 Cut 1,500 g. 2,950 g.
24/15 Oz. 25 Count Up 200 g. 410 g.
24/15 Oz. 20 Count Up 200 g. 410 g.
24/15 Oz. 18 Count Up 200 g. 410 g.
24/15 Oz. 15 Count Up 200 g. 410 g.
24/15 Oz. 13 Count Up 200 g. 410 g.
24/15 Oz. Cut 200 g. 410 g.
Glass Bottle 12/12 Oz. 13 - 18 Count Up 190 g. 340 g.
Glass Bottle 12/ 8 Oz. 13 - 18 Count Up 140 g. 227 g.